On Saturday, July 17, 2010, a truck and trailer arrived at Born Free USA’s Primate Sanctuary outside San Antonio, Texas after a two day, 1,700 mile journey. Inside were fifteen male long-tailed macaques, rescued from a closing pharmaceutical laboratory. These young primates would now spend the rest of their lives not in isolated cages, but rather in a large, tree-filled enclosure with others of their kind. Before the macaques could be transitioned into their new home, they needed to be anesthetized for health checks and the removal of the restraint collars used to control them in the laboratory. Each macaque arrived at the sanctuary with a diamond-shaped collar, made from either hard nylon or aluminum, bolted around his neck. 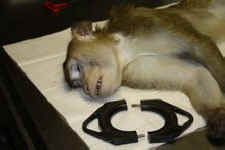 These collars had been used in the “pole-and-collar” handling system common in primate research facilities: a “capture pole” clasps onto either triangular end of the collar and is used to control the monkey outside of his or her cage. According to the collar manufacturer, their use “reduces stress on the animals and helps ensure handlers’ safety. Through positive reinforcement, primates quickly learn their role in handling procedures and become participants rather than subjects of them.” While this description makes the human-monkey interaction sound complicit, video taken by the Humane Society of the United States in 2009 during their undercover investigation of a laboratory in Louisiana (the Born Free macaques came from a different lab) shows a handler using the pole-and-collar system to violently remove primates from their cages. Ernie, after his collar has been removed...forever! Born Free USA recently donated 13 of the collars removed from their macaques. The collars show damage from years of use. The nylon is gouged and the gold-colored coating on the aluminum is worn where a capture pole would attach. They range in size from “Medium Macaque” (inside diameter 2.5"; base 4", length 6 1/8") to “Small Baboon” (inside diameter 3 1/2"; base 5", length 7"). The collars are embossed with the logo for the Florida-based Primate Products, Inc., which provides laboratories with everything from cages and restraint chairs to live primates, genetic testing services, and personnel training. 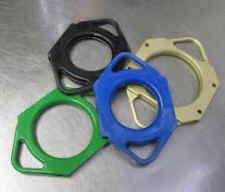 The collars can be found on page 10 of Primate Products, Inc.’s catalog. Learn more about Born Free USA's Primate Sanctuary and the rescue here.